A man cave is often converted from a spare bedroom, or bit of unfinished basement. Those are convenient enough if you have the space but lots of people don't. The folks at Stoltzfus Structures have come up with their own solution to this problem. Call it a cave in a box, or maybe an instant cave. Essentially it is a storage shed decked out for comfort. The idea of a prepackaged external home expansion isn't new. We have written about office pods and studios on this site previously. This is a nice attempt to take advantage of the popularity of man-caves to sell a souped up storage shed. You could get the same thing hand made locally, and you would have more opportunity to customize it to your liking, but the Stoltzfus price seems reasonable. If you want a cave quickly, without the hassle, this will give you a good value for your money. 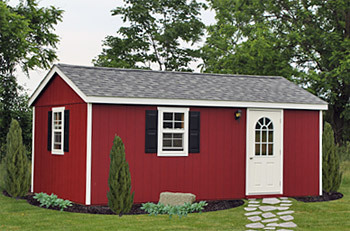 One advantage of the garden shed look is that it may fly under the radar for zoning laws and building permits. That will depend on your local situation. 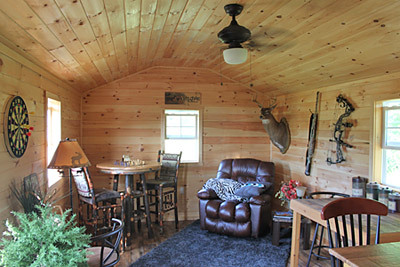 Whether you use this as a get away, or as an office, or a studio, the idea of having living space in an outbuilding can make a lot of economic sense. However this particular building has no arrangements for plumbing and sewage. That means a trip back to the big house. This keeps the costs down, and probably simplifies the permitting, but it does make it somewhat less than a total solution. Still, a little walk down a garden path isn't so bad, and if it saves you a few thousand dollars it might be a reasonable trade-off.